For all questions about wood, please use the "Wood Inquiry Form" instead of the general contact form. 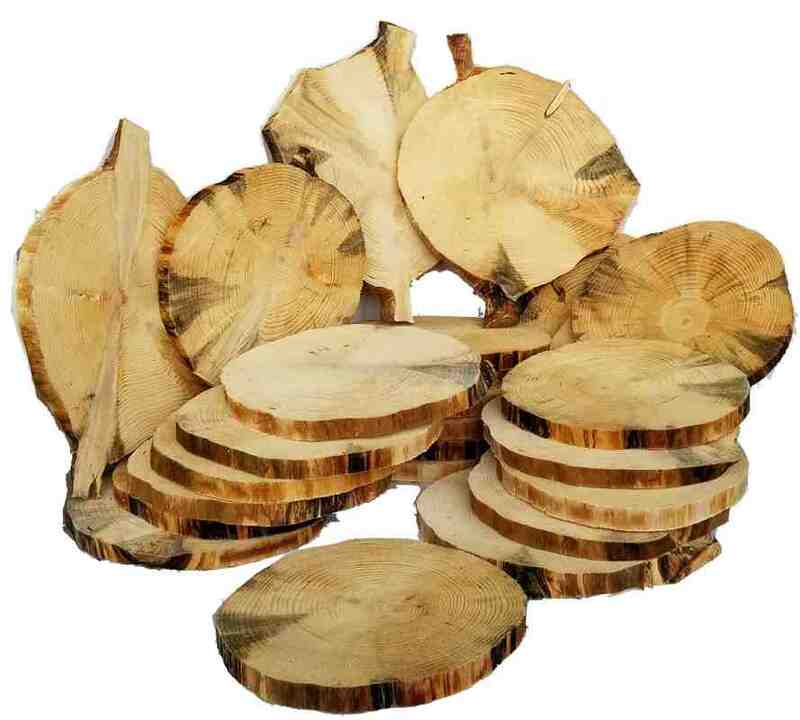 Large sized wood slices can be used for a great number of rustic projects including bases for many projects, table tops, dart boards, wood burning (pyrography) and basic wall art and applications. The slices with high spalt and lots of character can be used for wall art, and other interesting home accents. Be sure to also check the Bargain Bin page as I may be adding some odds and ends while I am doing spring shop cleaning! Please check my Pinterest Page for wood ideas that I have been gathering! Photos are of actual product you will receive. 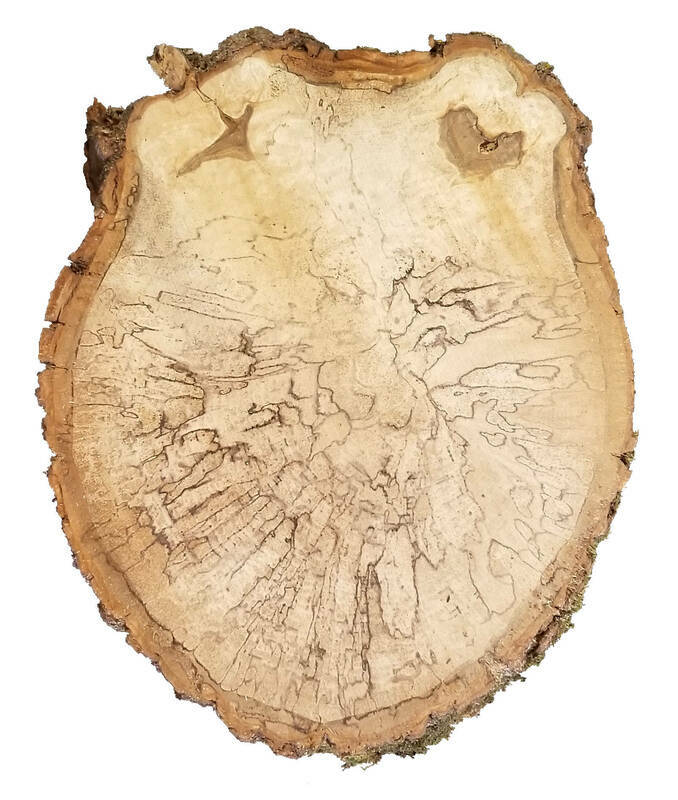 Example of how beautiful spalted basswood will look when oil is applied to bring out the character. Beautiful High Spalt Basswood - 8 - 9" dia. x 1"
This is beautifully spalted basswood, cut at the perfect time. 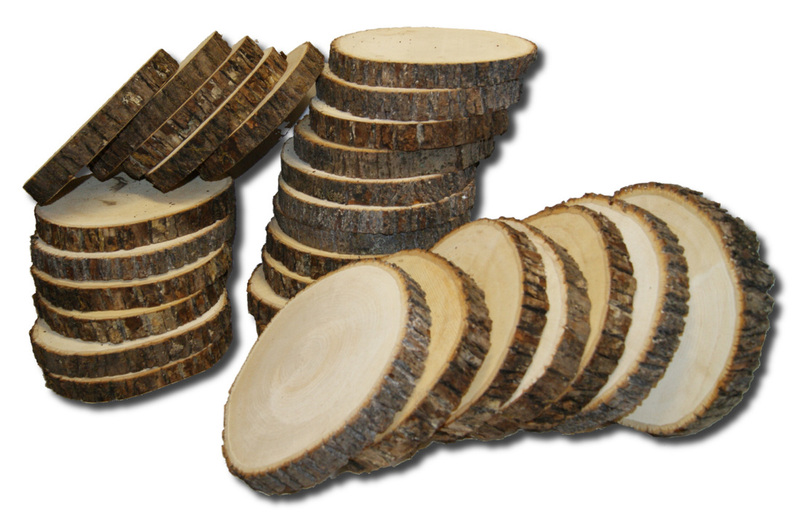 These slices are 8 - 9" in diameter, and cut at 1" thick. Never treated. Sanded on both sides. Bark intact. Won't last long! Crotch Cut High Spalt Basswood - 8.5 - 10" dia. x 1"
If you like high spalt and the unique shapes of crotch-cuts, you will love these slices. These are about 8.5 - 10" in diameter and 1" thick. Sanded on both sides. Never treated. Dry. Intact bark. Very nice oval shaped and slightly spalted basswood log slices. Measuring the short way across a slice it is approximately 9 to 9.5" across, and measuring the long way across it is approximately 10 - 11" across. These are cut at 1" thick. Not sanded or treated. Bark is intact. Sliced-up Log -- Put Back Together! I thought I would try something different...... click on the images on the right! I took a log, sliced it up into 1" slices, and stacked it back together again! This log has some interesting shapes, and has beautiful spalt on the inside. Bark is in excellent shape. You can see that the back is fairly straight, but the front is full of character where other branches used to be. Sold as a set for substantial savings over buying single slices. Normally slices this size would be around $8 or $9 each. Purchase these for less than $5.45 per slice. If this idea doesn't sell quickly I will just sell them per slice. **​Make a lamp by putting spacers and LED lights in between the slices. **Use as a puzzle. It is not easy to put these slices back in order! **Put them on display sideways for some kind of art - be creative! $125.00 - Only one set available! stored in laundry basket - in order! 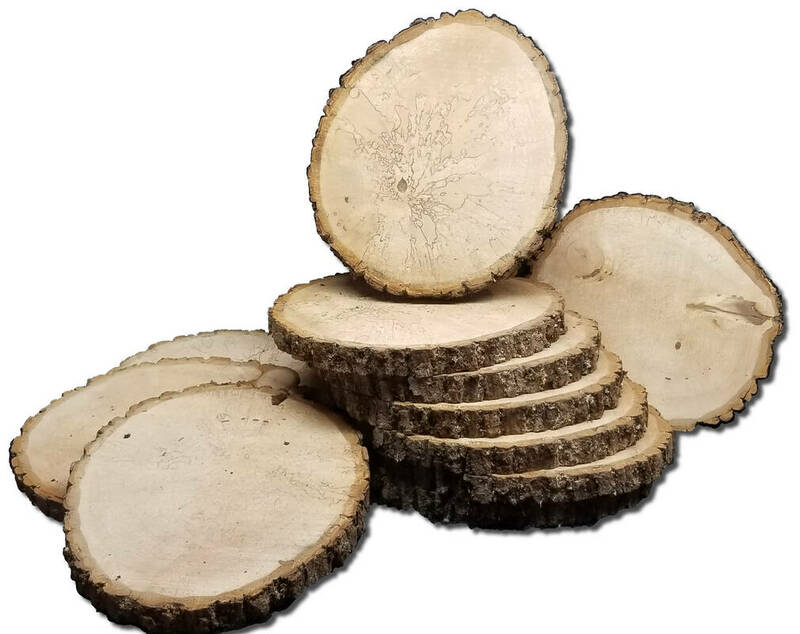 Large Red Pine Log Slices 15"
These large red pine log slices are about 15" in diameter and 1-1/2" thick. Treated. Not sanded. So far they have not cracked. Some gray streaks and some bark missing. Large Red Pine Log Slices 14"
Red Pine Log Slices. Treated to resist cracking. Not sanded. Bark intact. Averaging around 14" in diameter and 1" thick. These are premium pine slices that you won't find anywhere else. Barkless - Clean Pine Slices 13"
Sometimes you want the bark, but sometimes you want a clean look. The wood underneath of the bark is beautiful. 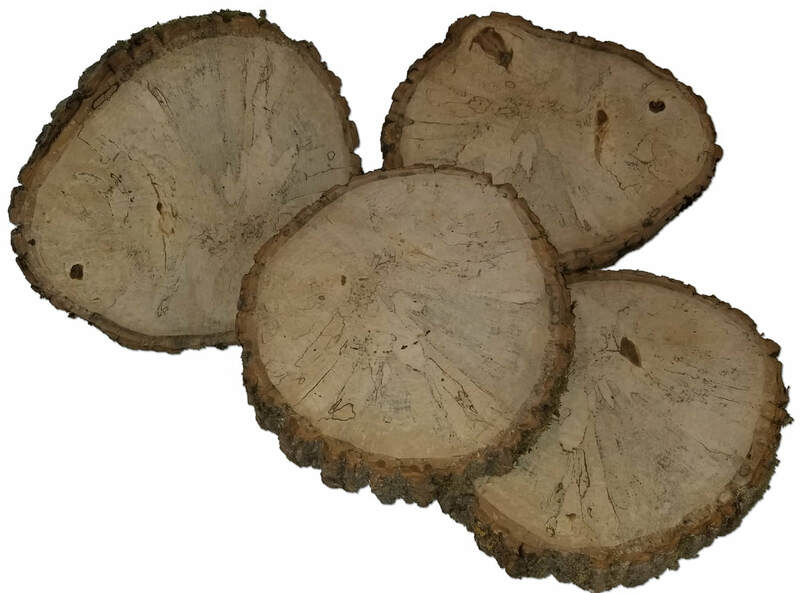 These are premium pine log slices measuring 13" in diameter and a full 2" thick. Treated to resist cracking. Not sanded. These won't last long. 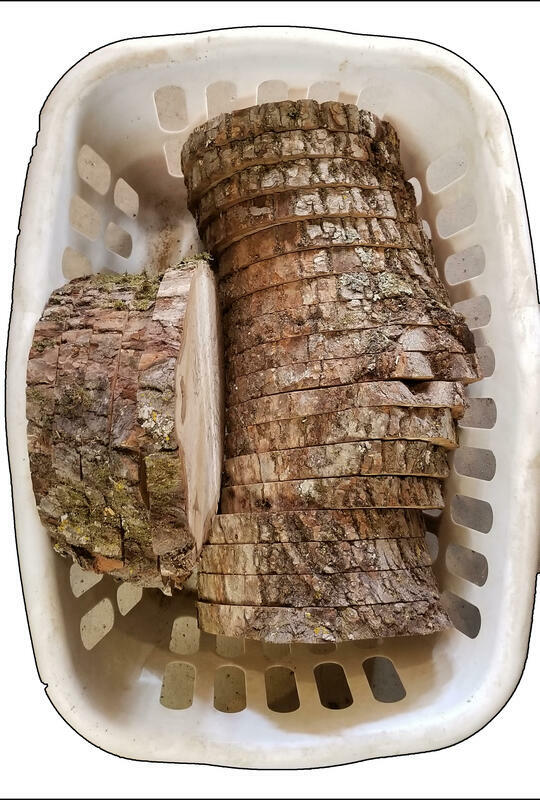 Barkless - Rustic Pine Log Slices 11-12"
I really like these slices. Cut at the perfect time to get the gray marks. No bark on these for a cleaner look. Treated. Not sanded. No cracks. If you like basswood with character, this is it! These have been sitting on the shelf for a long time.....I simply forgot to post them to the website. These slices measure 12" to 14" in diameter, and are 1-1/2" thick. 100% natural, not treated or sanded. Rough, rustic cut with beautiful spalt markings. Even though these slices were treated, they are developing a few small cracks. Red Pine is notorious for that. Very heavy, as they are about 14" in diameter and 2-3/4" thick. Excellent bark. Beautiful wood. Some gray streaks. Old stock. We still have a few of these left. These were dipped in treatment and air dried. Very dry, as they were cut over a year ago. Good shape, but bark might be a little fragile, but the wood is clear and in good condition. Shipping is calculated at check-out. Enter quantity in box below that is equal to or less than current inventory amount. Cart keeps track of inventory so no item is oversold. $12.99 each. How To Transfer Text And Images To Wood - Download the PDF below for FREE!